(Cattle Exploitation - Dairy - 06) This cow has some form of udder ailment, which appears to be quite common in the dairy industry. 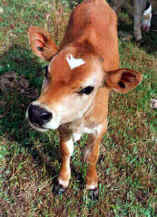 According to our sources, farmers continue to milk cows like this one, and most of their milk is considered drinkable. We can only imagine how painful this must be.